When I read the story about Brittany Maynard - I can't tell you how sad I am about this. See I've seen family members fighting cancer. I've seen my cousin at death's door quite a few times with little hope yet he managed to bounce back several times - from terminal brain cancer. I watched my mom fight breast cancer once and it come back again. I watched how she fought the second time but didn't win. We are ALL dying. Just some of us are sick for a long time before. I don't think anyone really 'wants' to die. (Even though as saved Christians we hear all the time that we can't wait to get to heaven - I really don't believe we are jumping at the opportunity.) If we are saved - trusted in Jesus who died for our sins- then we know this life is not the end. We know we go to a better place. That gives me peace for dying. It gives me peace to know I'll see my loved ones again. So I'm not afraid of what is next. So we are all dying - every day a little bit at a time. And you know what? That is okay. So what if your given 2 weeks, 3 months, 1 year. Well, then you have a bit of knowledge the rest of us don't have. You have the opportunity to LOVE MORE, HUG MORE, LAUGH MORE, LIVE MORE, LEARN MORE and honestly we all should be living like we are dying! Just like that country song by Tim McGraw. I would hope if I was faced with the same path as Brittany that I would choose to cling to Jesus. That I would trust in HIS PERFECT TIMING for my departure. I would hope that I would show my kids how to die. How? With love for them, for my husband, for my extended family, for my friends and for My Jesus! I hope I would take each breath as a chance to remind them how much I love them. I hope I would count each day as a blessing. See I just can't imagine ending my time before I needed to. What if I didn't have that last Christmas with my Mom (the one we didn't know would be her last.) What if I didn't get to see my cousin Mark at his last Easter completely healthy? What about that elderly couple that plans on dying together? They feel they are only a burden on their children and society. 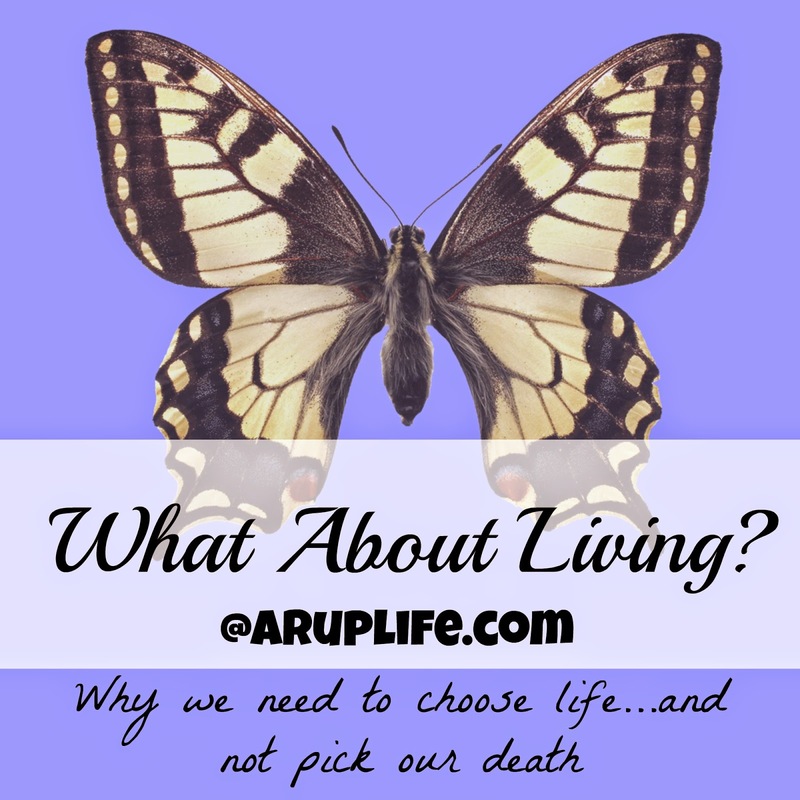 What has happened to our thinking that we no longer value life? When we go down this slippery path of assisted suicide (and yes it is suicide - make no mistake about that - no matter what fancy label they attach to the whole thing) - where do we stop? Do we start encouraging the chronically sick to think of the 'bigger picture' or 'society's needs'. Do we only value the young and healthy. Is their life the only one worth living? Do we play god? Deciding who gets a quality life and who should pass on for the greater good? See I believe every life is of value from that first cell until the last breath. I think about this sweet couple that knew that their baby wouldn't survive outside the womb. The spent the month's leading up to Baby Shane's birth celebrating the life he had. The didn't choose abortion - the chose life!